By the early 600s, Roman and Persian armies had been trading blows for so many centuries that an eternal continuation of their Near East derby must have seemed a certainty. Here a raid into Mesopotamia, there a clash in the Taurus Mountains, border provinces shifting back and forth … countless dynasties had come and gone, world religions risen and fallen, and always there were the Romans and the Persians. It was the way of the cosmos ever since Carrhae. Tribes boiling out of the Arabian desert were about to reorder the firmament. After an exhausting and pointless struggle* stretching back generations, Byzantium under the emperor Heraclius had rallied in the late 620s to re-establish its formerly longstanding control of the Levant — incidentally pushing Persia’s Sassanid Empire to the brink of collapse. Neither polity would enjoy much leave to lick its wounds. The Byzantines’ first passing skirmish with Muslim warriors had occurred in 629, when the Prophet Muhammad was still alive. By the time of Muhammad’s death and the succession of the Caliphate in 632, Islam had all of Arabia firmly in hand and would begin the dazzling expansion destined within a single lifetime to carry the Quran from the Pillars of Hercules to the Indus valley — greatly facilitated by the scanty resistance offered by is battle-wearied neighbors in Constantinople and Ctesiphon. You will come upon a people who live like hermits in monasteries, believing that they have given up all for God. Let them be and destroy not their monasteries. And you will meet other people who are partisans of Satan and worshippers of the Cross, who shave the centre of their heads so that you can see the scalp. Assail them with your swords until they submit to Islam or pay the Jizya. After striking Mesopotamia (and crushing an internal rebellion), Caliphate armies pressed into Byzantine Syria and Palestine in 634 and soon controlled it — eventually delivering a decisive, nay world-altering, defeat to the Byzantine Christians at the Battle of Yarmouk in August 636. The martyrology of Christians said to have been put to death on this date in 637 or 638 may be rated among the artifacts left to the shocked Romans; the victims would have numbered among the garrison in Gaza which would not fall to the Muslims until September 637. The below is excerpted from Robert Hoyland‘s Seeing Islam as Others Saw It: A Survey and Evaluation of Christian, Jewish and Zoroastrian Writings on Early Islam. Although the author is skeptical of the account’s historicity — preserved as it was only by a centuries-later third-hand fragment — the traumatic cultural memory it speaks to can hardly be doubted. It happened at that time regarding the godless Saracens that they besieged the Christ-beloved city of Gaza and, driven by necessity, the citizens sought a treaty. This was done. The Saracens indeed gave to them a pledge, except to the soldiers who were captured in that city. Rather, marching into the city and seizing the most Christian soldiers, they put them in prison. On the next day ‘Amr (Ambrus) ordered the Christ-holy soldiers to be presented. Once brought before him, he constrained them to desist from the confession of Christ and from the precious and life-giving cross of our Lord Jesus Christ. Since they would not consent, ‘Amr ordered their wives, children and weapons to be separated from them, and again to put them in prison. Thirty days later they were transferred to a prison in Eleutheropolis for two months, then to a prison in “Theropolis” for three months before being taken to Jerusalem. There they are urged by the patriarch Sophronius to stand firm and accept martyrdom. After a further ten months incarceration ‘Amr wrote to “Ammiras who was commander in the holy city,” recommending that he execute a number of them if they still refused to deny Christ. 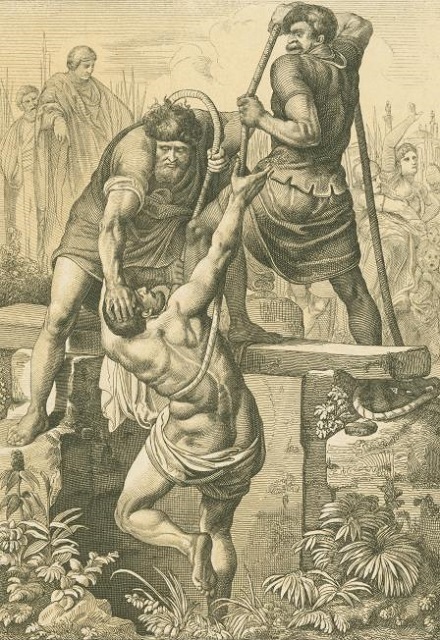 Finding them obdurate, Ammiras has their chief Callinicus and nine others beheaded on 11 Novebember 638 “outside the city in front of the gates,” where they are buried by Sophronius. The rest are sent back a month or so later to ‘Amr in Eleutheropolis and given a final chance to comply. Unanimously, however, they witness that they are “servants of Christ, son of the living God” and “prepared to die for him who died and rose for us,” thus sealing their fate. Their bodies were bought for 3000 solidi and the church of the Holy Trinity was erected over their burial place at Eleutheropolis. The date given for their martyrdom is Thursday 17 December (which tallies for 638), indiction 13 (639-640), year 28 of Heraclius (September 637-September 638). Since the choice of conversion or death seems mostly to have been reserved for Arab Christians and apostates from Islam, one is immediately suspicious of this account. It may be that these soldiers were made an example of for some particular cause, but there are other reasons for being wary of this text. In the first place, its provenance is unknown, since the Vatican manuscript containing it is our only witness. Secondly, it is very likely that we have merely a summary of a much longer piece. The changes of venue occur at a bewildering pace and with no explanation or elaboration, ‘Amr’s identity is not indicated, and the manner of death of the 50 remaining soldiers is not mentioned at all, even though this is usually a subject of much interest in martyrologies. Furthermore, one would expect the impassioned exhortation to martyrdom by the revered Sophronius and the emotive scene of him burying the martyrs to be accorded more than the paltry eight lines found in our version. * Robin Pierson covers these years of backstory in depth in his History of Byzantium podcast; he’s interviewed for an overview of the Byzantine-Sassanid War(s) in a premium episode of the War Nerd podcast here. 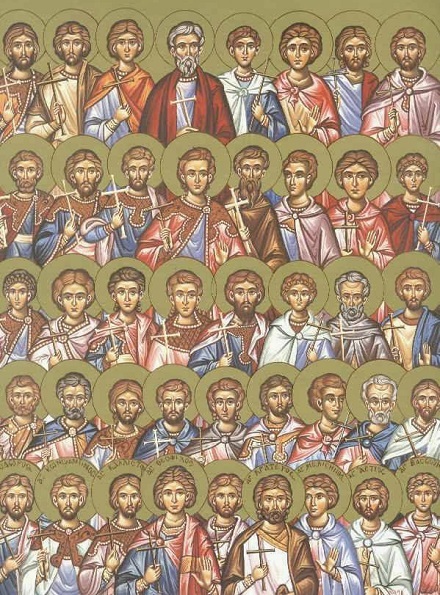 March 6 is the feast date of the 42 Martyrs of Amorium, the day in the year 845 when they submitted to the caliphate’s executioners in preference to conversion. It seems a fitting fate for mere individuals ground up between states and faiths; even so, their weedy tombs mark a fork on the path trod by Byzantium. The 42 earned their martyrs’ crowns at the end of seven years’ imprisonment, so it is to the Byzantine war with the Abbasid Caliphate in 837-838 that we must return to unravel their story. This war was itself merely the resumption of a conflict that had been ongoing between the civilizations for two centuries since Arab conquerors emerged from the desert to found an empire. 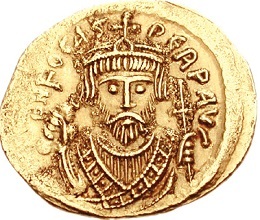 With the connivance, encouragement, or cajoling of anti-caliphate rebel Babak Khorramdin, the young Byzantine emperor Theophilos broke four years of tense peace with destructive effect in 837, ravaging the Upper Euphrates. “He captured and burned the fortress of Zapetra, putting to death the male population and carrying off the women and children,” John Bury wrote in A History of the Eastern Empire from the fall of Irene to the Accession of Basil I. Upon his return to the mandatory official Triumph, “[t]roops of children with garlands of flowers went out to meet the Emperor as he entered the capital. In the Hippodrome he competed himself in the first race, driving a white chariot and in the costume of a Blue charioteer;** and when he was crowned as winner, the spectators greeted him with the allusive cry, ‘Welcome, incomparable champion! '” Because the one thing 200 years of engaging the Arabs in back-and-forth raids, counterattacks, and suits for peace had taught Byzantium was that victories would surely prove durable. In truth this war was also politics by other means — domestic politics, that is. Theophilos really did aspire to incomparable championhood of something far more important than the position of the frontier: in matters religious, he was a stringent iconoclast and he meant to win Christendom firmly over to this philosophy. The century-old schism within the communion — pitting iconoclasts, like Theophilos, who condemned as idolatrous the veneration of religious imagery against iconophiles or iconodules who embraced it — itself likely owed much to the stunning march of Arab arms and the wound Caliphate success had inflicted on a state and faith that had formerly presumed itself hegemonic. It was certainly the case that Roman superstition† perceived in the battlefield results of imperial adherents to the rival icon’isms a going divine referendum. God says go with whichever icon policy starts beating Islam! 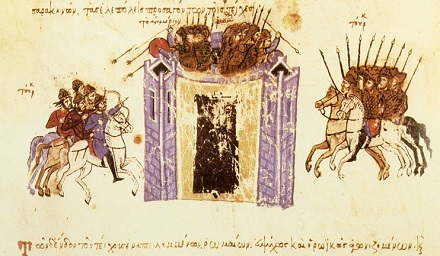 The caliph al-Mu’tasim counterattacked the Unfortunate ruthlessly in 838, invading Anatolia in two huge columns that converged on a major city, Amorium.‡ There, they penetrated the city’s walls and put her to the sack — slaughtering unnumbered thousands and carrying away most survivors as slaves, outrageously unmolested by the chastisement of any Byzantine army. 12th century illustration from the Madrid Skylitzes, an edition of the chronicle written by 11th century Greek historian John Skylitzes. The volume was produced in Sicily; it’s got “Madrid” in the name because that’s where the sole surviving copy of it resides today. Byzantium might have been fortunate on this occasion that, before he could extend his conquest, al-Mu’tasim’s domestic politics promptly recalled him to the caliphate to deal with plots against his own throne. But the raid devastated the martial credibility of Theophilos the incomparable champion, and with it the credibility of iconoclasm. Nor can there have been much fortune reckoned by the thousands of prisoners marched out of the smouldering ruins of Amorium to the new Arab capital Samarra — among whom we find this post’s titular 42 martyrs. They were, or at least seemed, the crown jewels among the captives, meaning the ones with cash value. Constantinople and Samarra would engage in periodic negotiations over the next several years to exchange them; the Caliphate’s insistence on obtaining for their return a treasure equal to the cost it had incurred to attack Amorium in the first place put an unbridgeable gap between the sides. The nameless and rankless commoners among them went to their nameless destinies; undoubtedly their experience was cruel and many died or were killed, but for those who endured the tribulations there was a return to hearth and home in a prisoner exchange in 841. For the VIPs, deliverance sank into the Mesopotamian mud. Both Theophilos and al-Mu’tasim died in 842 and sometime around there the respective empires seem to have given up trying to resolve the impasse about the Amorium ransom. A few more years on with no apparent relief forthcoming from the annoyance of maintaining these now-useless prisoners of war, someone in Samarra decided to dispose of them with the ultimatum. Their martyrs’ glory assured their afterlife in Byzantine religious propaganda. Yes, these two Christian sects had made martyrs of one another within the empire. But iconoclasm really hinged on one crucial argument fatally undone by the 42 martyrs: victory. The pro-icon emperors from 797 to 813 had been associated with retreat and humiliation;§ one had even been killed on campaign in the Balkans leaving the Bulgar king Krum to fashion the imperial skull into a ceremonial goblet. That the iconoclast rulers of the succeeding generation had at least stabilized the situation was their ultimate scoreboard taunt. Amorium dispelled that glow of providential favor, especially when followed by the years-long abandonment of that razed city’s noble hostages to the heathen dungeon. Little could the monk Euodios know that his iconoclasm-tweaking hagiography of these martyrs would prove a redundant step. The late Theophilos had only an infant son, so governance after his death fell to a regency led by the empress Theodora. Despite her dead husband’s scruples, Theodora didn’t mind an icon one bit, and restored icon veneration to a favor it would never again lose for the six centuries remaining to Byzantium. ** One of the principal charioteering teams/factions that had, centuries before, nearly overthrown Justinian and Theodora. † Among the Romans themselves for whom supernatural causation was an assumed fact on the ground, superstitio had a more attenuated meaning, contrasting with religio. That is far afield for this post; I use the term here advisedly from a post-Enlightenment cosmology. ‡ Amorium is no more today: just a ruin buried under a village. But not because of this siege. § Charlemagne being crowned “Holy Roman Emperor” in 800 was also a gesture of disregard for a weakened (and at that moment, female-ruled) Byzantium, which dignified itself the Roman Empire despite having long since abandoned Rome itself. This is the supposed martyrdom date, in the year 764 or perhaps 765, of St. Stephen the Younger in Constantinople at the hands of an iconoclastic emperor. Ancient and “dark ages” history characteristically comes with all kinds of problems arising from the paucity and prejudice of primary sources. 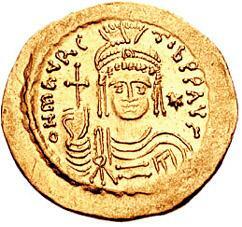 Byzantium’s century of Iconoclastic controversy is a fine example. In this period from approximately 726 to 842, the empire was rent by a conflict between iconophiles or iconodules — proponents of the use and adoration of religious imagery in Christian worship — and iconoclasts — who abhorred same as a form of sacrilegious idolatry. But in posterity we are reduced to these muddy qualifiers because as the winning party in the dispute, iconodules wrote the history. That’s no moralistic stab: iconoclasts, too, burned the enemy’s tracts when they had the opportunity; had they prevailed in the end, they would have blurred out the background, motivations, and achievements of their rivals as readily as the iconodules did and leave those who followed to read between the lines of a partisan history. Indeed, Bissera Pentcheva’s recent Icons and Power: The Mother of God in Byzantium even contends that the legendary centrality of icons to Byzantine religiosity was an invention of the post-iconoclastic era, with events like the Marian icon’s saving Constantinople during the Avar siege of 626 backfilled to replace the original story about Marian relics working the divine intervention. Iconoclasts plastering over an icon. 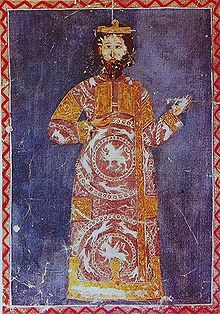 The iconoclastic era opens in the late 720s; according to the (iconodule, naturally) saint and historian Nicephorous, its immediate trigger was the devastating 726 eruption of the Greek island Thera (Santorini) — and affrighted by the apparent divine wrath, “the impious emperor Leo [III] started making pronouncements about the removal of the holy and venerable icons.” He’s alleged to have taken down a particularly revered icon of Christ on Constantinople’s Chalke Gate. Nevertheless, it is difficult to get a firm fix on what specific anti-icon policies Leo promulgated, if indeed there were any at all. (The Greek term for “pronouncements” could be understood simply as “comments” instead of “edicts”.) 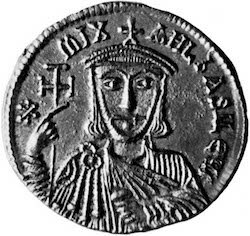 It is Leo’s son Constantine V, succeeding the purple in 741, who clearly brings an overt imperial turn against icons, for “He cannot be depicted. 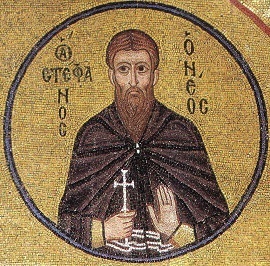 For what is depicted in one person, and he who circumscribes that person has plainly circumscribed the divine nature which is incapable of being circumscribed.” Constantine convened an ecumenical council that ruled for his anti-icon position and set about removing images from churches. Against this campaign was ranged the bulk of the clergy — church vs. state is another possible and difficult-to-measure dimension of the whole dispute, although Constantine’s ability to win the acquiescence of hundreds of bishops must complicate this interpretation. The great champion of and martyr for the iconodule position in this time was St. Stephen the Younger. That’s “younger” vis-a-vis the original St. Stephen, Christianity’s protomartyr. As befits that exalted company, this monk and hermit was credited by his adherents with a supernatural power in the iconoclasm debate. But not for the first time, an imperial innovation in theology failed to outlast the patronage of its sovereign. After Constantine’s death, Empress Irene** restored the iconodules to favor† — and set the stage (after some hiccups) for a great flowering of Orthodox icons in the centuries to come. * Also see Episode 75, delving into Constantine’s iconoclasm. ** The fact that the extant remnant of the Roman Empire had no emperor — merely a woman ruler — formed part of the rationale for the western church crowning Charlemagne “Holy Roman Emperor”. This slap in the face to Constantinople could occur because a papacy long deferential to Byzantium had at last broken with the East in the mid-8th century … in part, over iconoclasm. 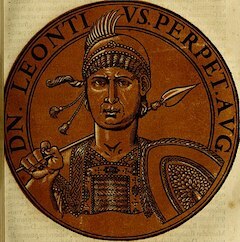 † Emperor Leo V restored official iconoclasm in 813 for another 29-year run as imperial policy before the movement’s final defeat. 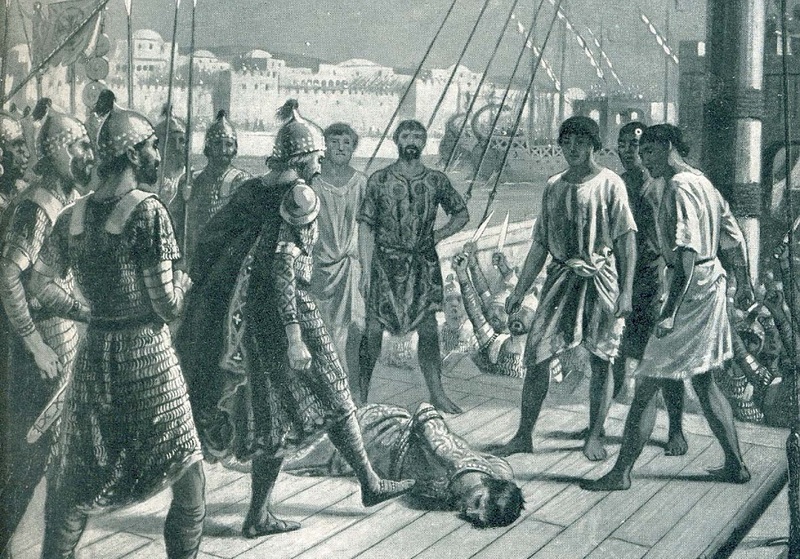 At some point around August 476 — the exact date(s) lost to history — the deposed Eastern Roman Emperor Basiliscus was executed most cruelly with his family. But having himself played for power with ruthlessness to equal his rivals, Basiliscus was hardly in a position to complain about the treatment. Besides, his killers were just playing by the rules. The mid-470s saw a confused succession of countercoups toppling short-lived successors to the able Leo I. The succession went initially to a a 7-year-old grandson whose father, an Isaurian warrior, was proclaimed co-emperor to give the state adult supervision. When the kid died mysteriously (or “mysteriously”) months into his reign, the dad became Emperor Zeno. As a “barbarian” who had married into the imperial family, Zeno couldn’t catch a break from the capital. He was run out of town in January 475 by a conspiracy of grandees, who elevated our man Basiliscus to power. (Basilicus nailed down the throne by executing his chief rival among the plotters for Big Man in Constantinople.) Basiliscus had been a general in his own right with a somewhat mixed track record; the highlight entry on his c.v. was a gigantic 468 invasion of Carthage that came to such catastrophic grief tht Basiliscus upon his return had to hide out in the basilica of Hagia Sophia claiming sanctuary to protect himself from popular fury. * Eventually the lynch mob died down and Basiliscus copped a pardon from Emperor Leo and returned to prominence in time to be a leading player in the putsch. Demonstrating his customary aptitude for great undertakings, Basiliscus immediately busted as emperor. A huge fire ravaged Constantinople under his watch. He recalled exiled Monophysite clergy, leading the patriarch of Constantinople to drape icons in the Hagia Sophia in black. It wasn’t long before daggers were drawn for Basiliscus in his scheming court, just as they had been for Zeno. In fact, it was Zeno himself who would be the instrument of his successor’s destruction. A general dispatched to Isauria to take care of the absconded Zeno got word of the gathering discontent and switched to backing the former and now future emperor. As they marched together on Constantinople, a second general sent to stop them also backstabbed Basiliscus by making an arrangement with Zeno to march his defending army down the wrong road. The barbarian warlord looked pretty good to the Senate by now, and it threw open the gates of Constantinople to welcome back its former master in August of 476. Basiliscus for the second time in his life made tracks for the sanctuary of Hagia Sophia. It’s said that the restored Zeno got rid of Basiliscus without violating the church via a nasty little ruse: he got the former emperor to abandon sanctuary with a promise never to spill his blood, then promptly had Basiliscus together with his wife and his son thrown into a dry cistern at some Cappadocian fortress to desiccate from exposure. Zeno would have made a great lawyer. Basiliscus forced into the cistern. The restored Emperor Zeno reigned for 15 more years, during which he caused a schism in the church and played a lot of backgammon. Legend has it that he too met a horrific end by deprivation when he drank himself into such a stupor** that he was buried as dead, and finally awoke to find himself entombed. By now quite unpopular himself, he was roundly ignored as he pounded on the inside of his sarcophagus shouting for aid. Robin Pierson’s History of Byzantium podcast handles this period in episodes 2 and 3. ** Or alternatively (but less expressively, in moral terms), fell very ill — an epileptic coma, perhaps.